Getting your first own pet is a task linked to many responsibilities, but also to a lot joy. By adopting a little puppy, kitten or rabbit kit, you are signing up for a lot of unconditional love from your new friend. On the other hand, pets rely on us to protect them, take care of them and teach them how to behave “properly”. Especially young animals are curious, wild and full of energy. They explore everything and try to eat anything that comes even remotely to their claws, paws and snouts. They are, simply, adorable – and in many regards like human babies as well. This also includes a fear of being abandoned and left alone in a world they are not yet ready to live in on their own. It will take some time for your little dog or cat to realize that you will return when you leave the house without them. In the meantime, you can make the situation for them as comfortable as possible. Read more about why cats are good for your health. We are, by no means, animal behaviorists, but there are countless reliable sources on the web that can tell you how to properly crate train your beloved pet, or how to make their time without you the most comfortable. However, we are here to tell you about the benefits that music and ambient sounds have for your pets. One of our users, Nicolle, has already noticed the benefit of calming ambient sounds to calm her pup down. Check out her mix for crate time or being separated. In an earlier article, we have already explored what kind of music is good for your pets. There are many positive effects music and sounds in general have on cats, dogs and other animals. Even cows show that music effects them, as explained on the ModernFarmer.com. They state that calming and consistent music is beneficial for cows, especially through the milking process. Our furry or feathered (or scaled) friends at home can gain from stimulating, calming or soothing sounds as well. Especially for training purposes, you can expose your pet to a moderate amount of ambient noise that will prepare them to not freak out in certain situations. Different smells and other distractions will still be hard to tackle for your pup or kitten, but that way, you can at least rest assured that the sounds around them are not causing any additional distress. Cooking & kitchen, vacuum cleaners, washing machine & dryer, and more. Loud, clanking sounds you produce while cooking or cleaning the dishes – a daily task your pet will have to witness – can distress young animals. Dogs and cats are very sensitive to noises of all kinds, and especially loud and sudden noises can scare a young pup or kitten. By exposing them to the sounds produced in your kitchen or even home workshop, you take that fear and shock of such sudden noises from them. It is bad enough that we push around big, frightening machines to clean our floors and carpets. By teaching young animals that they do not have to be afraid of the sound of a vacuum cleaner, you are one step closer to them not running around in a frenzy when trying to clean up. But not only cats and dogs suffer from these particular noises. Rodents and other nocturnal animals are heavily effected by our daylight noises. We are the most active, productive and thus loud when rats, sugar gliders and hamsters try to catch their (literally) daily dose of sleep. Thus, even when you are not at home, exposing them to some random daily noises will help them to adjust to the normal noise level of your house during the day. It makes it easier for them to sleep despite the commotion around them. House parties, festivals, the city, and more. Of course you are hardly taking your house cat out for a walk, but other animals are often exposed to big masses of humans – and expected to react calm and friendly in such situations. Dogs and even rats are often taken out for a walk or stroll with their humans, as are horses in some circumstances. A big crowd of people is scaring, especially if you are a smaller animal. Thus, getting them accustomed to people early on is important. The sounds of big crowds can at least help to take the scary part out of the auditory distractions they’d have to face. Here, other animals benefit as well though. Having guests over for a house party of BBQ is, at one point, a very new experience for your pet. Prepare them to the noise level of a party to eliminate stress factors one by one. Independence day, parties, New Years Eve, thunderstorms, and more. With July 4th approaching, every dog owner is facing another problem: fireworks. Twice a year, during Independence day and New Years Eve, our night skies are filled with colorful blooming flowers and sparkly rain. And noise, a lot of noise. But even outside of these occasions, the weather can arrange its very own fireworks with loud thunderclaps and lightning bolts. For the sensitive ears of a cat or dog, and the rather sensitive nature of a horse or rabbit, thunderstorms and celebrations with fireworks mean a lot of stress. 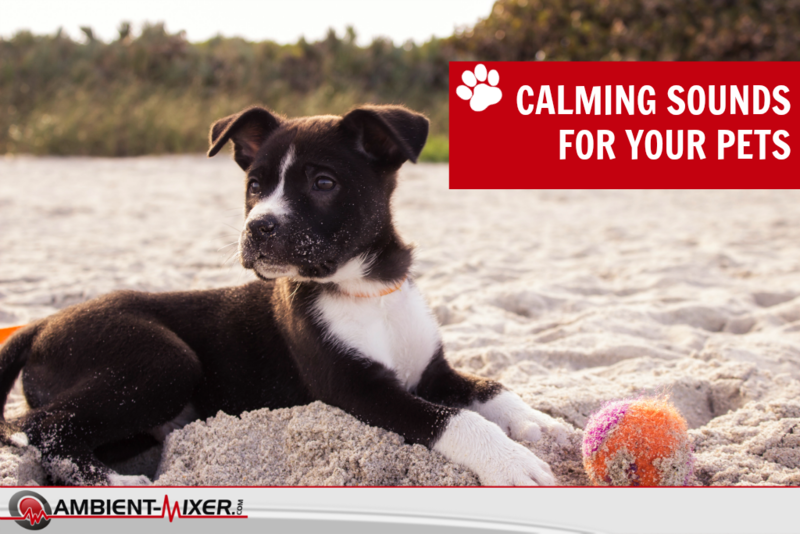 Getting your pets accustomed to the concept of sound not being able to harm them, can help them to keep their calm during loud celebrations or stormy weather.